An employer in the United States, or anywhere for that matter, must screen all applicants and maintain a safe work environment. Drug use can be one of the greatest dangers to a workplace, due to the impaired judgement and the obvious distractions that can come about from inappropriate consumption. Drug testing is a standard approach to screen both current employees as well as those applying for employment. There can be other reasons for drug testing as well, such as athletes that are being screened for performance enhancing substances. 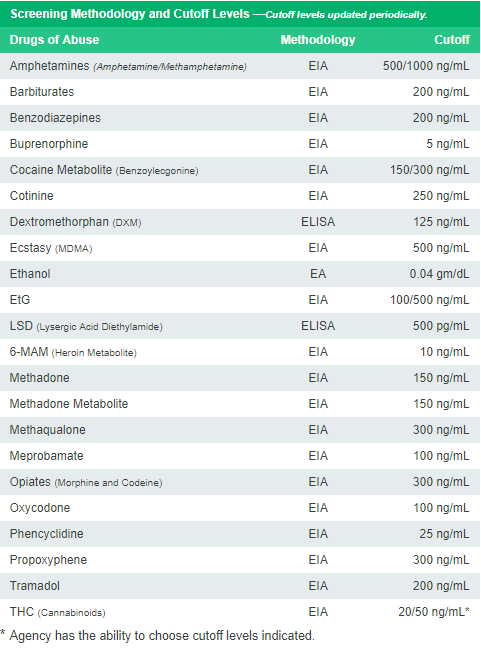 Not to mention the fact that many substances are illegal to consume in the first place. Legal prescription drugs are flooding the black market and if ingested inappropriately can impact an individual’s judgement as drastically as some of the most illicit drugs. The ongoing debate about cannabis, the cultural shift in perspective concerning the plant and newly acquired knowledge concerning the potential medicinal benefits of cannabis is making some people rethink drug testing standards for THC. The U.S. Department of Health and Human Services (CMS / CLIA) has set cutoff standards for permissible amounts of THC detected within a subject’s system, along with other substances. They set the cutoff for THC at 20/50 nanograms per milliliter (ng/ml). One nanogram is one-billionth of a gram, which may not seem like much, and it isn’t. However, it does not necessarily take a lot of THC to create the euphoric effect that the employers are concerned will cause impaired judgement. A lot of drug testing has also taken into account that THC is typically only active in an individual’s system for a few hours, except in cases of chronic use where it can last for 12 hours or more. But inactive THC can linger in fatty tissue for months afterwards which many people have come to understand. Private employers can set stricter or looser standards for the amount of THC found ng/ml than the standards of the U.S. Department of Health and Human Services. Considering the shift in thinking towards cannabis and that many states have legalized medical marijuana, a lot of employers and other agencies are reconsidering what is a permissible amount of THC for a person to have circulating within their system. Take Olympic athletes and WADA (World Anti-Doping Agency), where the concern is performance enhancement from drug consumption. A person may think it unreasonable to even consider marijuana as a performance enhancer, possibly even laughable, regardless marijuana is still a banned substance by WADA. Before 2013, permissible amounts of THC for Olympic athletes were similar to typical employment standards. But with a better understanding of cannabis WADA changed its standards so that Olympic athletes only need to have less than 150 ng/ml to pass tests now. At what level of competition should drug testing be introduced for marijuana if even Olympic athletes are allowed to smoke a little days before competition? According to data released by Quest Diagnostic, the amount of failed employer drug tests from THC consumption has been on a steady rise for years. The acceptance of cannabis is resulting in possibly more marijuana consumption or simply a more relaxed attitude towards it, meaning that employees are not as worried about drug tests as they once were and are no longer being as cautious. Whatever the reason, employers still need employees and if their restrictions concerning marijuana consumption are too stringent, they will find it challenging to find the workforce they need.